At the peak of where southbound I-35 splits to navigate toward Dallas or Fort Worth respectively, lies the city of Denton, which is flooded with both rooted history and thriving artists. There is an Americana personality that has led the maker movement in North Texas, and has been a place of inspiration for many aspiring creatives. 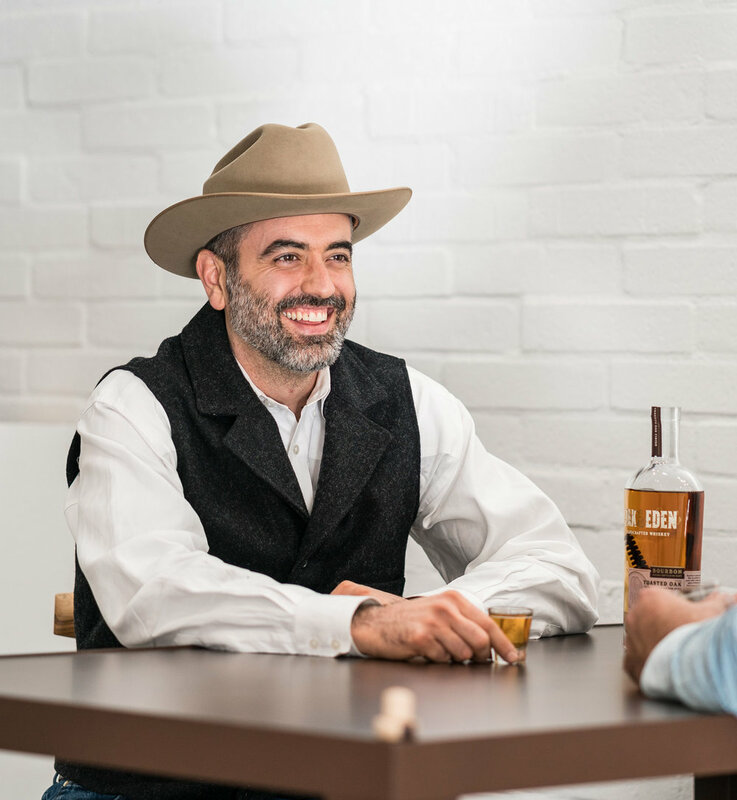 Head to Denton (or many parts of North Texas for that matter) and ask anyone about Clint Wilkinson, or his former brand name, Bell & Oak, and you'll receive an overwhelming response of admiration among a vast majority of the locals. Clint is one of the world's most revered leather artists, and has become a bit of a celebrity on both the local and national sphere. Odds are, you've seen his work in one setting or another, although you may not have realized it. And every bit of his work is crafted 100% by Clint himself. When you come across his work for the first time, it's almost intimidating. The work Clint produces is intense. Not only is everything designed with unmatched intimacy, but his hand-tooling is something one could easily get lost in for hours. Putting your hands on a piece of his work is something to marvel over. 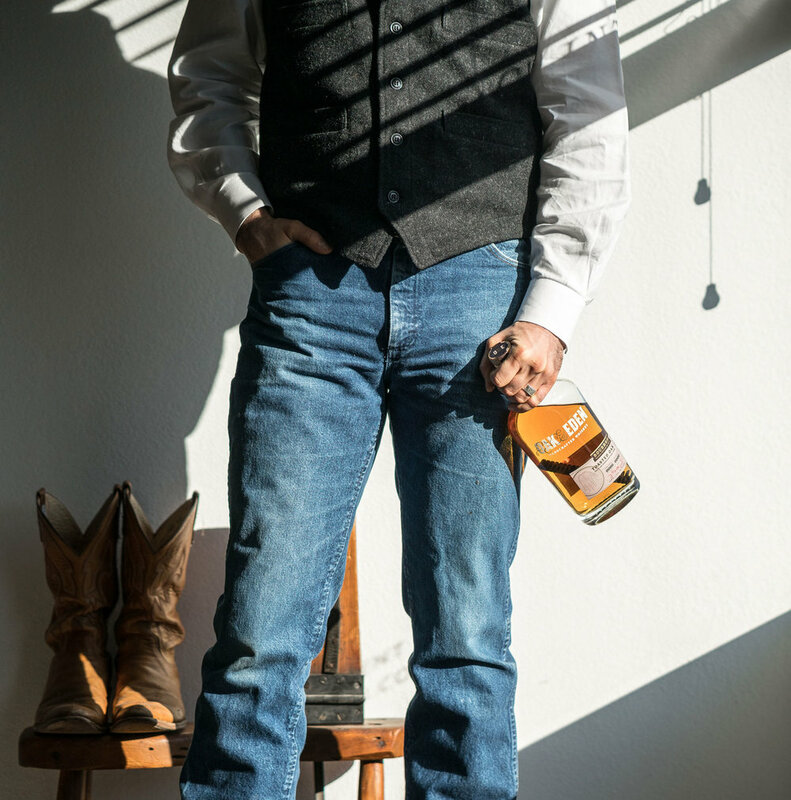 Clint's grandfather was a well-known saddle maker in Denton, and after Clint experienced the high-paced life of new media, he returned to his roots and expounded upon his grandfather's craft. Over the years, he has acquired quite the client list, including Leon Bridges, the George W. Bush Presidential Library, Montana Watch Company, Stetson, just to name a few. We were privileged to spend a day in Clint's workshop in downtown Denton, observing his craft, sipping The Bourbon together. Enjoy! Hey clint, why don't you Introduce yourself. Clint: My name is Clint Wilkinson and I'm a leather artist from Denton, Texas. Clint: I've had many personal backgrounds over a short period of time. I've enjoyed art in many different forms throughout my life, and leather was always in the background after growing up in my grandfather's saddle shop. One Christmas my parents bought me a dirt bike and I never looked back. I left the western culture to race dirtbikes from age 11 - 21. During that time I was interested in photography/film which eventually led me into graphic design. When I would go riding with friends, I would take their photos and film them, go back home to edit the photos, make a short film, then copy it to a VHS tape so they could have it. After I quit racing dirt bikes, I got a job at a motocross magazine, where I would eventually become Art Director. I did that for a few years, then left to start my own online motocross publication in 2007 with some friends. It grew into the #1 motocross website in the world by 2011. After living in the fast-paced media world, I decided I needed to take a step back and think about my family business. Since nobody else in my family was interested in working with leather, I had to consider who would continue my grandfather's legacy of 60 years? So, in 2012 I made the transition of leaving behind the media industry into becoming a legacy of my grandfathers craft. Can you tell us a little more about the background of your business? Clint: When I first started working with leather, I had to make a decision to name it something. At first, everything I made was stamped "Weldon's Saddle Shop" and rightfully so, being as this was the name of my grandfather's saddle shop. But as I thought about it more, what if Weldon's goes out of business one day? So I decided to name my business Bell & Oak; the two street corners that Weldon's sat on for 60 years. 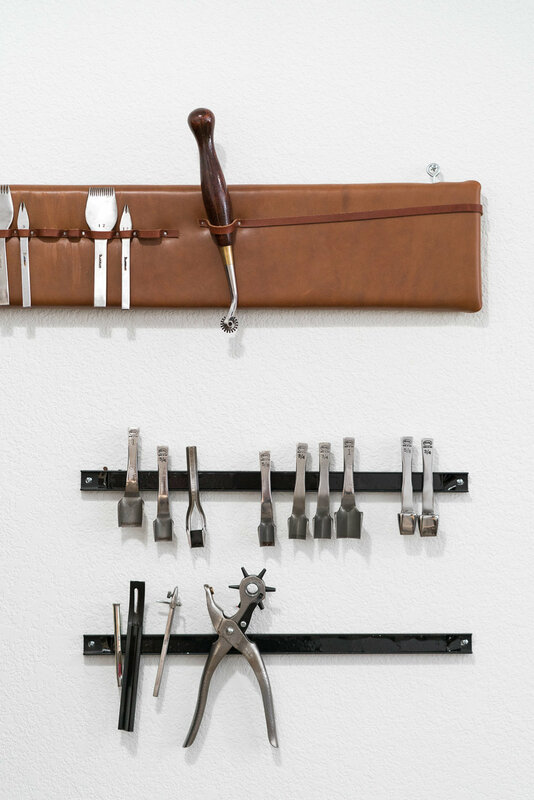 The Bell & Oak products carried very simple designs, using mostly Horween and bridle leathers. The products had a real Americana feel, but also sophisticated enough for a business person to carry. As time went on and more people started jumping on the "maker movement" bandwagon, makers' products started to look similar. So in 2016 I dropped the Bell & Oak name and changed the name to "Wilkinson"; my last name. This has allowed me the freedom an artist would want, as I'm designing under my own name. People are getting to know Clint Wilkinson - the artist, instead of Bell & Oak - the "brand". The Wilkinson products are completely different than my old Bell & Oak products. Everything I make now is done with extreme attention to detail. I spend hours hand-sewing all of my products to ensure longevity that a machine-sewn item can't produce. The leathers I use now are world-class, sourced from some of the oldest, most well-respected tanneries in France, Italy, Germany, and America. I make briefcases, women bags, wallets, watch straps, portfolios and the like. I work with all sorts of clients around the country that all share a common theme: they want a highly-crafted piece of functional art that will last them a long time. There is a large amount of trust put into my work. If clients are going to pay top dollar, they expect the best, and I'm one of very few in the United States who can produce such work. Clint: Denton is home to me, my family has been here for over six generations. My grandfather's western shop was in business in downtown for 60 years until it closed early last year. It's a growing community, but still has a small town feel that I enjoy. Most people would expect me to live in Dallas because of the work I create, but I'm not a fan of living in big cities. Who are some of the craftsmen (leather or otherwise) that you draw inspiration from? Clint: I'm drawn to western craftsmanship because of my roots, so I really look up to saddle-makers like Cary Schwarz, Pedro Pidrini, Troy West, and Chuck Stormes. I also enjoy silversmiths like Wilson Capron, Ernie Marsh, Braidie Butters, and Ken Hunt. As for other leather craftspeople, the Japanese are really inspiring with their perfectionism. I enjoy taking inspiration from Hajime Niwa, Tsuyoshi Yamashita, and shoemaker Hiro Yanagimachi. What is the process that leather must undergo to ensure it lasts a lifetime? Clint: Well, "last a lifetime" gets thrown around loosely these days, especially by new craftsman who are trying to make a name for themselves quickly. Unfortunately, the customers are left to figure it out on their own. My job is to educate the public on why my products are superior to others. I would say the most important aspect of my work is the hand-sewing techniques I have refined. I'm essentially creating tiny little knots in everything stitch hole that won't come unraveled if broken. Where machine-sewn items will break a stitch, then slowly come unraveled, hand sewn items won't because of the interlocking knots I create. 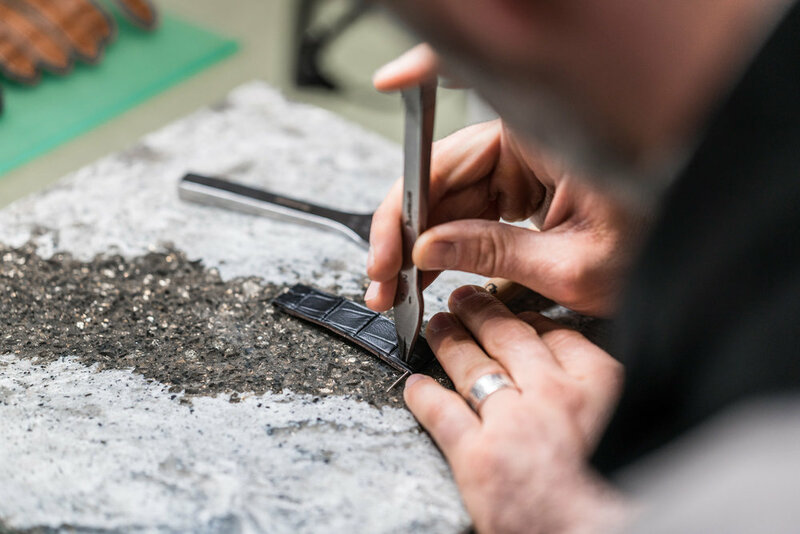 From there, I polish the edges to keep dirt out from in between the layers of leather, I source world-class leathers that are made to last, and I ensure my clients condition those leathers a couple times a year with some leather treatment. Do you have any hobbies outside of crafting leather? What does a few days off work look like for you? Clint: Right now its all about my kids who are playing basketball. They're really into sports right now, so I'm usually with them on my days off. However, I've got aspirations to get into mountain biking sometime in 2018. Are you a bourbon or rye guy?